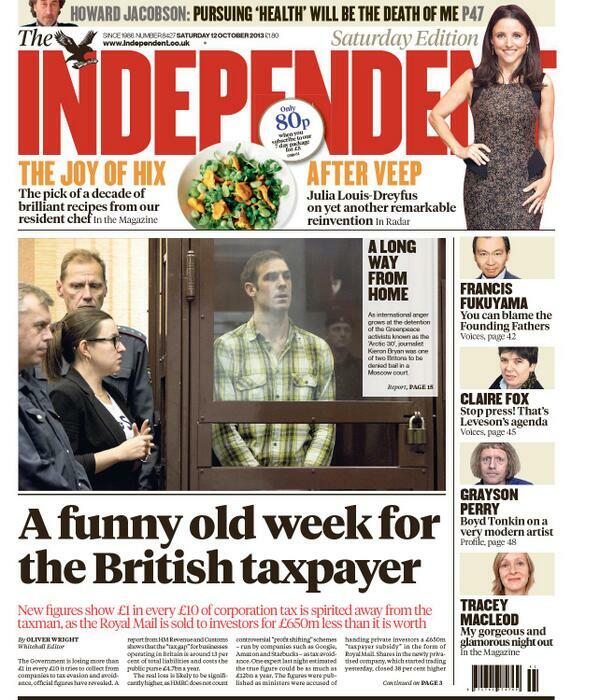 Kieron appears today (Sat 12th October) on the front page of national newspaper the Independent. "There should be a greater international outcry over Russia’s arrest of Greenpeace activists and charging them with piracy." US - Russian relations are arguably not at a peak right now, but nevertheless having someone of Hillary Clinton's stature speak out in support of the thirty detainees is certainly a positive. "It's very patchy, and many fragments are not very comprehensible. However, what [can be understood] goes as follows: 1) The judge, through the interpreter, announces to Kieron Bryan his rights (including the right to demand recusation [sic] of the judge, the prosecutor, the interpreter). 2) The attorney mentioned that the "vessel" was not properly registered -- the judge then referred to certain documents from the notary officer that, allegedly, proved the opposite. 3) The attorney argued that the platform was "an island", while only a movable object not attached to the sea bed can be considered a vessel -- the judge announced that the request for appeal has been rejected."" "Bryan's legal team argued that the lower court overlooked the fact that the UK cameraman was not bound by any contracts to Greenpeace, and was present on the Arctic Sunrise as an independent journalist. His lawyers also said that the environmentalists' actions could not be described as an act of piracy, which suggests an attack on a vessel, because the Prirazlomnaya oilrig is an artificial island, not a vessel." Putin's spokesman makes it very clear that the President has no influence over the actions and conclusions of the investigative committee. ""Again, the president is not and cannot be responsible for discussing investigative procedures. This is not in the president's competence. Thus, he is unlikely to be involved in any discussion regarding these ongoing investigative procedures," Peskov said." Thursday's Al-Jazeera English piece is here: http://www.aljazeera.com/video/europe/2013/10/greenpeace-concerned-detained-activists-20131010232614193113.html . Friday's Radio Five Live appearance, just after bail was refused, can be found here: http://www.bbc.co.uk/programmes/b03c46nj from 1 hr 39 minutes. This includes a interview with Harriet Harman in which she expresses her firm support for Kieron. Correspondent Simon Harris does a great job in the studio explaining Kieron's position as a journalist. Peter Willcox, captain of the Arctic Sunrise, has been fined 20,000 rubles for not following coastguard instructions :http://lenta.ru/news/2013/10/09/captain/ (in Russian). Willcox remains imprisoned along with the other twenty-nine. These legal textbooks give more detail about piracy. As you'd expect, it's not light reading. According to one of these: 'The definition of piracy is somewhat obscured... '. This may all become very relevant depending on the progress of the Dutch legal action. "Sorry about this [the parcel situation], please do write him letters though, although you will have to type them, translate them and print them which i know is not as personal as a handwritten letter but will still be a huge source of entertainment and comfort for him." News has come from Cornwall of the Free Kieron Coffee Morning held today in Bude, which was a great success and very well attended. Total raised is currently estimated at £1,600. Thanks for Fran Lovett for organising this. We are working on a method for online donations to the Free Kieron fund - once this is all in place details will be posted here. Keep spreading the word. The more people that know, the more people that can help to Free Kieron.